In recent years, there have been major outbreaks of whooping cough among children in California, mumps in New York, and measles in Ohio's Amish countrydespite the fact that these are all vaccine-preventable diseases. Although America is the most medically advanced place in the world, many people disregard modern medicine in favor of using their faith to fight life threatening illnesses. Christian Scientists pray for healing instead of going to the doctor, Jehovah's Witnesses refuse blood transfusions, and ultra-Orthodox Jewish mohels spread herpes by using a primitive ritual to clean the wound. Tragically, children suffer and die every year from treatable diseases, and in most states it is legal for parents to deny their children care for religious reasons. In twenty-first century America, how could this be happening? In Bad Faith, acclaimed physician and author Dr. Paul Offit gives readers a never-before-seen look into the minds of those who choose to medically martyr themselves, or their children, in the name of religion. Offit chronicles the stories of these faithful and their children, whose devastating experiences highlight the tangled relationship between religion and medicine in America. Religious or not, this issue reaches everyonewhether you are seeking treatment at a Catholic hospital or trying to keep your kids safe from diseases spread by their unvaccinated peers. Replete with vivid storytelling and complex, compelling characters, Bad Faith makes a strenuous case that denying medicine to children in the name of religion isn't just unwise and immoral, but a rejection of the very best aspects of what belief itself has to offer. Paul A. Offit, MD, is a Professor of Pediatrics in the Division of Infectious Diseases at the University of Pennsylvania School of Medicine and Director of the Vaccine Education Center at the Children's Hospital of Philadelphia. The author of several books, he lives in Bala Cynwyd, Pennsylvania. Offit nobly endeavours to make peace with religion as concept, while simultaneously lambasting its more blinkered, potentially dangerous practitioners. 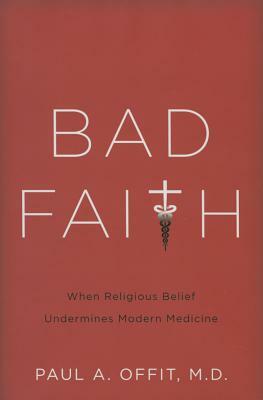 Using actual case histories to illustrate the needless suffering and deaths that occur as a result of these methods, Offit masterfully points out that the denial of medicine in the name of religion actually rejects the basic teaching of religious faith: relieving suffering, providing hope, and treating others as one would wish to be treated. An excellent book with an important message that belongs in all library collections.